Sadly, puppy scams are all too common in the UK – and in the US as well as many other countries. With the popularity and reach of the internet, pet scammers have new ways to reach out to you and your money, playing on your heartstrings and desire to add a four-legged member to your family. As an international pet shipping company, we at Starwood Animal Transport are well aware of puppy scams. We want you to know the facts, so your puppy acquisition experience is positive and the outcome is exactly what you hoped for. They may look and act legitimate, with a professional-looking website or by using business names or logos that mimic real pet-related businesses. Or they may pose as a pet owner needing to “rehome” their puppy because of personal hardship. They may pose as “rescuers” or small “breeders” offering very popular dogs at very low prices. Tiny toy breeds, Bull Dogs, and mixes such as Labradoodles are good examples. Sometimes the puppies are free – you pay only for “shipping,” but you never receive a dog. If you do receive a puppy through these offers, you can be pretty sure it came from a puppy mill. The ASPCA says there are about 10,000 puppy mills in the US, facilities where dogs are crowded, poorly fed or cared for. You want a puppy that is healthy and well-socialized with other dogs and people, so you can get off to a great start together. So just as with any other purchase, if the puppy offer seems too good to be true, it probably is. It’s not the right deal for you. There are so many wonderful, reliable sources to find the perfect puppy for your family. Your local animal shelter has dogs who are hoping to find their “furrever” home. They are mixed breeds and purebreds, senior dogs and – yes – puppies. If you want a particular breed, there are many breed-specific rescue groups across the country, working to find great homes for dogs that have been abandoned or mistreated. The adoption fees you pay to a shelter or rescue group support quality, healthy living environments for dogs in waiting, not a puppy mill or some other dodgy enterprise. Most of these organizations post photos of their current residents, so you can easily search for a puppy that appeals to you. Then you can visit in person to see if you’re a good match. That kind of chemistry is important when you’re choosing a pet you will cherish for years. Of course there are reputable dog breeders. Again, experts say the most important thing you can do is to visit the facility. Meet the breeder – check out the premises to see how dogs are treated, and check their references. Then meet the puppies that are available to see if one “clicks” with your family. Unfortunately, the puppies for sale in pet stores often come from puppy mills. The Humane Society recommends against buying one of these pups. Instead, look for a pet shop that partners with a shelter or rescue group to help “promote” dogs and puppies who need good homes. We know your heart goes out to puppy mill puppies. But you aren’t “rescuing” the pup if you buy one. You’re making room for another unfortunate puppy to take its place. And you’re helping the puppy mill owner make money. 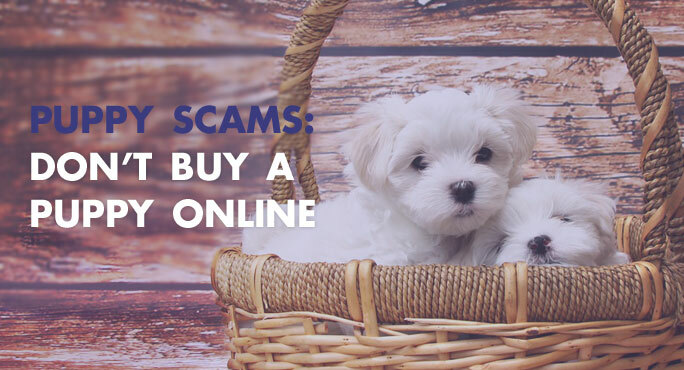 No matter how tempting it may seem, just say no to buying a puppy online. Dogs everywhere will thank you, and there are plenty of other ways you can find the pup of your dreams. Woof!